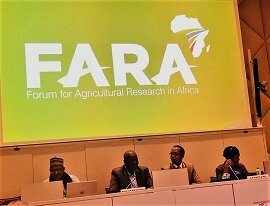 The Forum for Agricultural Research in Africa (FARA) is the apex continental organization mandated to coordinate agricultural research and innovation in Africa. FARA also serves as the technical arm of the Africa Union Commission (AUC) and the NEPAD Planning and Coordinating Agency (NPCA) on matters concerning science, technology and innovation for agriculture. FINANCIAL MANAGEMENT EXPERT ON FARA’S BOARD OF DIRECTORS. The mission of FARA is to contribute to generating high, broad-based and sustainable agricultural growth by catalysing improvements to the productivity and competitiveness of the sector through increased and effective application of Science, Technology and Innovation (STI). FARA executes its mission by performing the following functions within the context of supporting the implementation of the Science Agenda for Agriculture in Africa: (i) shaping the agenda for agricultural research and innovation at continental and lower levels; (ii) advocacy for increased application of STI in agriculture which is a necessary condition for achieving national and continental agricultural development goals; (iii) strengthening the human, institutional and systemic capacities for agricultural innovation; (iv) facilitating the exchange of information and knowledge in STI for agriculture; and (v) facilitating partnerships among research, innovation and agribusiness actors within Africa as well as between Africa and external regional or national entities. FARA’s Board of Directors provides governance oversight of FARA on behalf of the General Assembly. To this end, the Board holds two ordinary meetings annually. The Board’s membership includes a nonexecutive Director position for a Financial Management Expert who is charged with advising the Board on all matters concerning the organisation’s finances. The main role of this position is to serve as a member of the Board of Directors of FARA with specific responsibilities for advising the Board on all matters concerning management of the organisation’s finances, including but not limited to, budgets, audits, financial statements, the reserve fund, internal controls, investments, fundraising and compliance with the relevant financial management standards and finance-related statutory obligations. As a Director on the Board of FARA, the Financial Management Expert is expected to engage with other Board Directors in discharging the functions of the Board as prescribed in FARA’s Governance Manual. In addition, the Financial Management Expert shall perform the duties listed below. Advise the Board and its Committees on all issues concerning financial management. Strengthen compliance by the Board and its Committees, and the FARA Secretariat to best practices in financial management. Advise the Board on management of FARA’s financial risk. Advise the Board on the search process for the organisation’s external auditors. Advise the Board and the Secretariat on measures to strengthen compliance with finance-related statutory obligations, e.g. compliance with tax laws and the laws governing contributions to retirement plans. Advise the Board on measures to improve compliance with finance-related provisions of major agreements entered by FARA, e.g. the host country agreement. The Financial Management Expert on the Board of FARA is expected to deliver the functions prescribed above (Section B) and as may be directed by the Chairperson of the Board of FARA from time to time. The tenure of the Board appointment is three (3) years for an initial term with an option to serve for a second and final three-year term. The position requires a commitment of approximately 21 days in a year. FARA Board meetings are ordinarily held at the FARA Secretariat in Accra, Ghana. Board Directors may be assigned tasks that require them to travel to other locations as agreed with the Chairperson. As a Director on the Board of FARA, you are expected to undertake the services with the highest standards of professional and ethical considerations, competence and integrity. He/she is expected to deliver the outputs listed in Section C and D in a most effective and efficient manner within the assignment period stated in Section E of this document. The Financial Management Expert will report to the Chairperson of FARA. A Master’s degree in Accounting, Finance, Business Administration or related field plus a professional qualification in accounting i.e. ACCA, CPA, or equivalent. At least 15 years of practical hands-on experience in financial management or accounting; or at least 15 years employment/consultant experience in a senior Finance/Accounting position preferably in a reputable organisation, preferably an international non-profit organisation. (brochures, description of similar assignments, experience in similar conditions, availability of appropriate skills among staff, etc.). The Individual Consultant will be selected in accordance with the procedures set out in the World Bank’s Selection and Employment of Consultants by the World Bank Borrowers, January 2011 revised July 2014. Interested consultants may obtain further information at the address below during office hours 0900 to 1500 hours. Consultants are advised to quote the Assignment Title & Reference Number in the application.